Congratulations to Igor Paraskeva from Budapest in Hungary who has been selected as the winner of our recent Universal Audio giveaway! We hope you enjoy your prize Igor. Igor has chosen to receive a UAD-2 QUAD PCIe DSP Accelerator (he had the choice between that or a UAD-2 Satellite Firewire QUAD) - a $999 value. 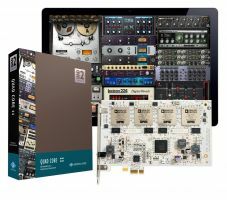 UAD-2 DSP Accelerator cards provide full access to UAD Powered Plug-Ins, including exclusive plug-ins from Studer, Ampex, Lexicon, Neve, Manley, Roland, SSL and more. The UAD-2 packages feature a user-installable PCIe-format processing card for your desktop tower or compatible expansion chassis, plus the "Analog Classics" plug-in bundle (VST/AU/RTAS), giving you vintage tone and character, right out of the box. Thanks to Universal Audio for supplying the prize and congratulations again to Igor. Fancy winning something? Our current giveaway is the u-he Synth Bundle Giveaway, which runs until October 8th, 2014. It's free to enter, simply sign up here.